You arrive at Kendal at Oberlin for your first visit and don’t know a soul. That’s likely to change soon after you arrive. Expect staff and residents to warmly greet you as you walk into the Heiser Community Center, eager to answer your questions and share “local knowledge” about the community where they live, work and play. Most everyone will be wearing a name tag, and they will want to know your name, too. You might even run into a friendly, four-legged friend at the front desk, where receptionists Sue and Veronica keep a supply of dog treats. As you walk around the campus with a staff member from the Marketing Department, you’ll continually run into residents laughing, talking, working, playing, planning and creating. Sharing a cup of coffee with a student from Oberlin College. Informal exchanges and activities are endless. And with more than 100 committees, residents have lots of opportunities to get involved in more formal activities. Take a glance at the multiple bulletin boards to get an idea of all the volunteer, community, Oberlin College and local activities going on. On your tour, here are 5 other things you’ll see. When it comes to fitness, Kendal has it covered. There is a four-lane lap pool and therapy pool, an exercise equipment room with state-of-the-art machines (open 24/7), a room with natural light for yoga, tap dance, balance and other classes, outdoor tennis courts and a walking trail. The wellness staff offers almost 70 hours of programming weekly, so residents have lots of opportunities to join a water or land class or activity. Many residents have bikes so they can enjoy the 100-acre campus, bike into town for errands or head to the paved North Coast Inland Trail. Residents interested in walking meet up most Saturday mornings and carpool to local parks for a mile or longer walk. Stop at the Heiser Auditorium, and depending on the day and time, you’ll see residents playing table tennis (don’t call it “ping pong”), listening to a lecture or musical performance, watching a movie, dancing, singing and more. The first Kendal Spells! was held there this summer. The idea to hold a spelling bee on campus grew out of Kendal’s success and enjoyment at Spellebrate Lorain County, sponsored by United Way of Greater Lorain County. And in April, a panel of “downsizing” experts gave an informative – and humorous – public forum on how to survive moving to a smaller home. Even if nothing is happening in Heiser, you’ll still want to head in that direction because one of three art galleries is located just outside the auditorium. Shows are eclectic and include photography, ceramics, paintings, weavings and other media created by residents and local and regional artists. Two years ago, a community space renovation was complete, and now woodworkers and artists have spacious and inviting spaces to do their thing. For a $20 lifetime membership, residents can join the Woodshop and use the hand and power tools whenever needed. Most of the members are long-time woodworkers who wanted to continue their hobby when they moved to Kendal. Members also repair items for other residents and undertake building projects for the Kendal campus and local non-profits. Next door to the Woodshop is the Creative Arts Studio, designed for both serious artists and novices interested in learning a new skill or just dabbling in one. Residents can reserve storage space and one of the drafting tables, sign up for a class or teach one. With the renovation, 12 to 15 people can comfortably work at the same time. The studio can also be reserved for meetings. “What a wonderful space; it is very welcoming,” Joyce Parker says. The 100-acre campus is home to eight ponds, more than 1,100 trees, a one-mile paved walking path and several covered walking bridges, which makes it an attractive place to walk, bike, bird and relax. A couple years ago, the grounds were accredited by ArbNet as The John Bartram Arboretum, which means even more TLC for the natural surroundings. 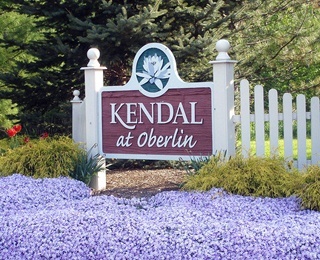 “The arboretum is one of the most important, if not the most promising, developments at Kendal that I have experienced in my 25-year association with Kendal,” CEO Barbara Thomas said at this spring’s second annual Arbor Day celebration. The arboretum committee started a Commemorative Tree Donation program and are involved in several educational and restorative projects. apartments, which are connected directly to the Heiser building and are also undergoing renovation.